Is The Archer Napa the catalyst for the revitalization of downtown Napa? Some say the catalyst for the revitalization of downtown Napa is the construction of the unique, luxury boutique property, The Archer Napa. There’s already proof to that theory. Even during construction of the 183-room property, it is attracting new business to the area. 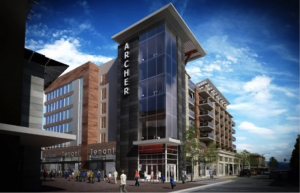 The Archer Napa hotel is being built around the former Merrill’s Building on First Street. The five-story property will anchor the new Napa Canter with its distinctive mix of shops, restaurants and entertainment in the heart of downtown. Developer LodgeWorks also plans to include much needed meeting space, a 7,000-square-foot rooftop bar that will be open to hotel guests and local residents alike, a pool, a separate outdoor patio and 218 parking spaces. The development totals 164,438 square feet and will cost about $70 million. Some of the exciting, luxury design details include 8-foot recessed balconies off the guest rooms and outdoor fireplaces to cater to an upscale clientele. The Archer Napa is expected to open in first half of 2016. If you are looking to sell or buy a luxury home, estate, vineyard or winery in Napa Valley or Sonoma, now is the time to get moving as construction of the Archer Napa Hotel gets underway, revitalizating downtown Napa. Please call me at 707-738-4820 or email me at [email protected] and LIKE me on Facebook to stay up to date on what’s happening in this part of the world.